NEW ORLEANS – The U.S. Track & Field and Cross Country Coaches Association (USTFCCCA) announced on Tuesday the winners of USTFCCCA Region Athletes and Coaches of the Year honors for the 2010 cross country season in Division III as voted by the division’s coaches. Wartburg College will host the NCAA Division III Cross Country Championships, this Saturday, November 20, at Max Championship Cross Country Course in Waverly, Iowa. The men’s race will begin at 11 a.m., Eastern, followed by the women’s race at noon. Berube, a junior from Putnam Station, N.Y., led the Knights to the NCAA Atlantic Region team title with a five-second individual win in the region. Berube also won the SUNYAC title earlier in the fall. Sathre, a junior from Chaska, Minn., won the NCAA Central Region title by nine seconds, helping the Tommies to a fifth-place showing in the region. During the season, Sathre won five of six races and placed seventh at the MIAC Championships. A junior from Dyer, Ind., Kramer helped the Knights to a big team victory at the NCAA Great Lakes Region in winning the individual title by nearly 13 seconds. At the MIAA Championships earlier in the fall, he led start to finish to repeat as conference champ. 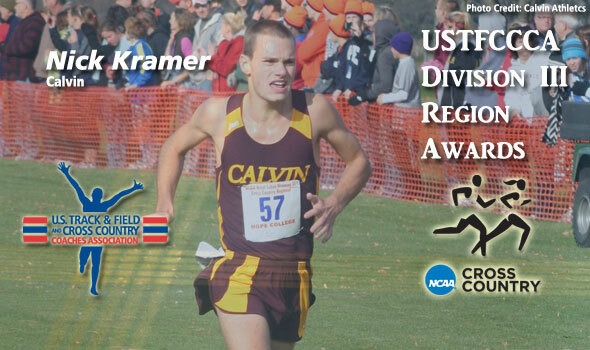 Kramer has won this award for the second-straight year. Hulleberg, a senior from Baltimore, Md., was the NCAA Mideast Region individual winner with a nine-second victory. Hulleberg also won the Centennial Conference crown earlier in the fall. The senior from Schaumberg, Ill., Spain led the Cardinals for the second-straight year to a regional title and won his second-straight regional title with a four-second victory. At the CCIW Championships, Spain led from the gun and won by 20 seconds. Schmidt, a junior from Wilmette, Ill., won the NCAA New England Region by four seconds in leading Middlebury to a fourth-place team showing. Schmidt was second individually at the NESCAC Championships as Middlebury would win their first-ever conference crown in men’s cross country. The junior from Stephens City, Va., Whitson won the NCAA South/Southeast Regional by 10 seconds. The Marlin was the ODAC runner-up earlier in the fall. Brainerd, a junior from Littleton, Colo., won his second-consecutive NCAA West Region crown, doing so by nearly seven seconds this year. Brainerd also repeated as champ of the SCAC and, in total, has won six of seven races this season. Woods’ team won the NCAA Atlantic Region title with an eight-point victory over runner-up St. Lawrence. Geneseo also won the SUNYAC title this fall. Woods is in this 18th year at Geneseo, has the No. 3 nationally-ranked team heading into the NCAA Championships. Freeman’s Grinnell team improved from a fifth-place regional showing in 2009 to win the NCAA Central Region title this season with a 97-133 victory over nearest competitor Luther. Grinnell also won the Midwest Conference crown, Freeman’s 28th overall cross country and track and field conference crown of his career. Grinnell enters the national meet as the 20th-ranked team in the country. Busch’s Little Giants placed second in the NCAA Great Lakes Regional, improving from their 12th-place finish a year ago. Busch, in his fourth season, also led his squad to a runner-up performance at the NCAC Championships. Wabash is nationally-ranked at No. 24 entering the NCAA Championships. Donnelly’s Fords won the NCAA Mideast Region with just 23 points, placing his five scorers in the top seven and full squad in the top 15. Haverford won the Centennial Conference meet with the scoring five finishing in the top seven. Donnelly, in his 36th year at Haverford, has the No. 2 nationally-ranked squad. Carius’ Cardinals won their third-straight NCAA Midwest Region crown with their top four placing in the meet’s top ten. The Cardinals won their 37th-straight CCIW title, notching just 17 points in this year’s title defense. Carius, North Central’s coach for the better part of four decades, has a squad ranked No. 1 heading into the national meet. Taylor’s Engineers won the NCAA New England Region by eight points over runner-up Williams. MIT, improving from a sixth-place regional finish in 2009, placed three in the top 12 in this year’s meet. MIT won their 13th-straight NEWMAC title this season with three runners placing in the race’s top five. Taylor is in his 29th season at MIT and his team is ranked 11th nationally. Thomasey, in his first year at the helm at Lynchburg, had a squad that won the NCAA South/Southeast Region title by 30 points and placed three in the race’s top ten. Lynchburg won a third-straight ODAC title this fall and was led by freshman Cody Stanton at the league meet. McGuirk’s Bearcats won the NCAA West Regional title, placing three in the top ten to score a two-point victory over runner-up Claremont-Mudd-Scripps. The Bearcats were second this fall in the Northwest Conference. McGuirk, in his seventh year at Willamette, has a squad nationally ranked at No. 14. The senior from Tupper Lake, N.Y., Pavlus won her third-consecutive NCAA Atlantic Region individual crown and did so this year by 41 seconds, helping the Saints to their second-straight team championship in the region. Unbeaten against D-III competition this season, Pavlus has picked up titles in the Liberty League and NYSCTC to go with the regional title. Tlach, a senior from Britt, Iowa, won the NCAA Central Regional title in a close race with Simpson senior Catie Ellingson and led the Knights to a second-place team finish in the region. In addition, Tlach finished fifth at the IIAC Championships earlier this fall. A senior from Chico, Calif., Johnson won the NCAA Great Lakes Region individual crown for the second time in her career, and this year did so by over 13 seconds. Having gone unbeaten in 2010, Johnson also won her third NCAC league crown, winning this year’s run by 52 seconds. Furlong, a junior from San Francisco, Calif., won the NCAA Mideast Region in a photofinish effort over Delaware Valley’s Caitlin Dorgan and helped the Jays to their third-straight regional crown. Furlong also took the Centennial Conference title earlier in the fall. A senior from North Easton, Mass., Lawton won the NCAA Midwest Regional by five seconds after pulling away from St. Norbert’s Jenny Scherer who was neck-and-neck with Lawton 1,000 meters out. Lawton also won the UAA title this season by 14 seconds. The sophomore from Sudbury, Mass., Gossels won the NCAA New England Region in a course-record 21:42.7 to win by seven seconds and was 30 seconds clear of third place. Gossels also won the NESCAC title earlier in the fall by 10 seconds. Gallegos, a junior from Kennesaw, Ga., helped the Eagles to a second-place team finish in the NCAA South/Southeast Region with an individual ten-second victory. A sophomore from Tokyo, Japan, Lydens led the Sagehens with a three-second victory in the NCAA West Regional. The SCIAC Runner of the Year, Lydens was the individual winner of the SCIAC Championships and SCIAC Multi-Duals. Howard, in his 22nd year at St. Lawrence, had a squad that won their second-straight NCAA Atlantic Regional with a 58-78 victory over SUNY Geneseo. The Saints also won the Liberty League crown this fall and enter the NCAA Championships as the nation’s second-ranked team. Pasche’s Norse won the NCAA Central Region by more than 40 points, vastly improving upon a seventh-place regional showing in 2009. Pasche, now in the seventh year at Luther, led the team to an IIAC title this fall and a No. 9 national ranking. Diemer’s Calvin squad won a fourth-straight NCAA Great Lakes Region title, placing three in the top ten this season to win by over 30 points. The Knights won their 29th MIAA title earlier this fall under Diemer who has been with the school since 1986. Calvin enters the national championships with a No. 6 national ranking. Van Allen’s Jays won a 68-126 decision over Dickinson for the NCAA Mideast crown after placing three in the top ten. The Jays have won three-straight region crowns, and with a Centennial Conference title this fall, three-straight league titles as well. Johns Hopkins enters the national meet at No. 4 in the nation. Schwamberger’s Blugolds won their second-straight NCAA Midwest Region crown with an eight-point victory over Washington (Mo.). The team, ranked No. 5 in the country, also won a fourth-straight WIAC crown this season with a two-point victory over UW Stevens Point. Schwamberger is in his fifth year with the Blugolds. Aldrich, in his 36th and final year at Middlebury, and his squad won a third-straight NCAA New England region title with a 33-point victory over Williams after placing all five in the race’s top 20. Middlebury, ranked No. 1 in the country, also won their third-straight and 11th overall NESCAC title this fall. Shankman’s Lynx won the NCAA South/Southeast Region, 50-54, over Emory. Rhodes placed three in the race’s top 10 and all five in the top 17. The Lynx, ranked No. 24 in the nation, won the SCAC title with a conference record 19 points. Goldhammer, winner of this award in 2008, had a squad that won the NCAA West Region with a 62-97 victory over Whitworth and placed three in the meet’s top 11. Goldhammer’s squad also won the SCIAC title this year and is ranked No. 11 in the nation. Goldhammer is in his 27th year at CMS.